Just got a card to share with you made with the Pick Of The Week Dies, The Rococo Fairies. 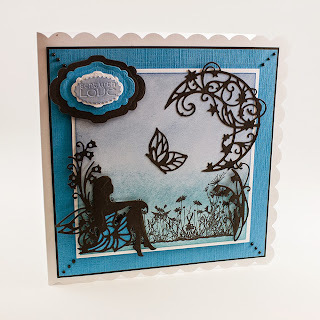 I used Rhoslyn, Luna and the Bluebell Butterfly from the new release dies along with the Layering Squares, the Elegant Ovals and one of the small wording dies from the Idyllics. The stamp was a freebie from a magazine, stamped in Stazon and the background. Don't forget to catch the shows with Jodie on Create and Craft.